Walk into any hip corporate headquarters or retailer and it’s instantly obvious: cookie-cutter design is out, and a carefully curated experience—for both shoppers and employees—is decidedly in. Following are three Park City businesses that are engaging customers and deepening their brand with outside-the-box features that include a window into history; play as a means to collaboration; and, be still our hearts, a grocery store taproom. 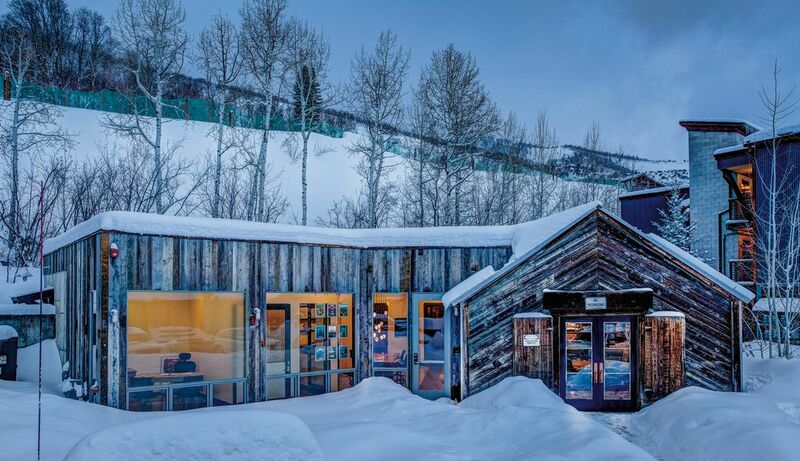 While plenty of Park City architecture and interiors are inspired by the area’s silver-mining past, only one is built around the entrance of a mine shaft. 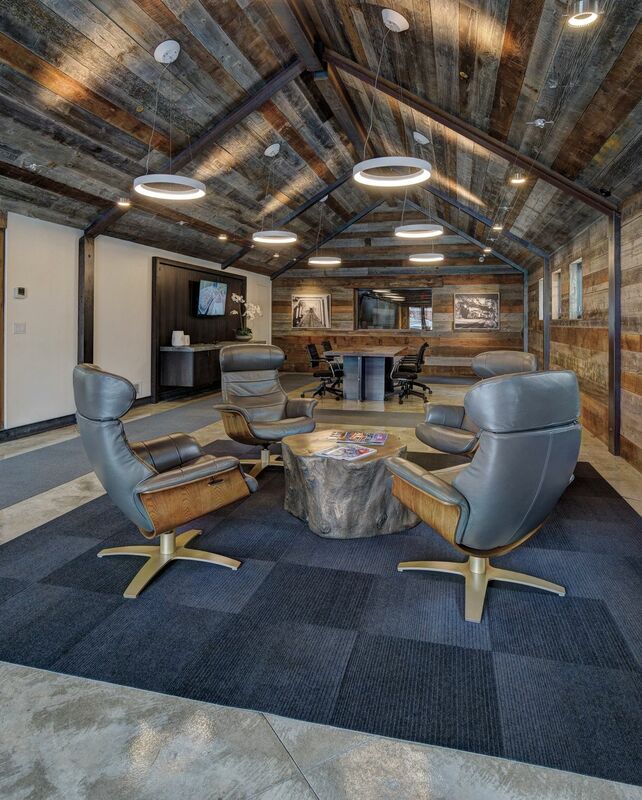 Tucked into Park City Mountain’s Silver Star base area is Rising Star Realtors (1835 Three Kings Dr, 435.649.3680), a 2,000-square-foot real-estate gallery anchored by the Ivers Tunnel. Reclaimed siding on Rising Star’s exterior hints at what visitors can expect on the inside: a glimpse into the Ivers Mine tunnel. While the office’s entry patio fire pits, rough-hewn timber exterior, and mod-meets-mining-chic interior design make it a popular community gathering and event space, the main attraction is found along the office’s back wall: a huge window revealing a surprise view into the Ivers Mine tunnel. “I wanted to create more of an experience coming into our office than just real estate, real estate, real estate, buy this, buy this, buy this,” Rising Star owner Alan Long explains. The painstaking preservation efforts of the 19th-century mine tunnel involved years of permits, soil removal, and piece-by-piece labeling as the building was taken apart and then reassembled with historical accuracy. With a flick of a switch, the foreground of the tunnel is lit. Another switch and more distant illumination hints at the three miles of depth beyond what’s visible through the glass. Given that the tunnel is a secondary access to the town’s water (the Spiro Mine tunnel is the city’s primary source), no unauthorized physical entry is permitted. However, the office’s agents are happy to relate the tunnel’s mining and Skier Subway history as visitors peer into the past. Huge windows and the lack of office cubicles set the stage for collaboration at Skullcandy’s Kimball Junction headquarters. 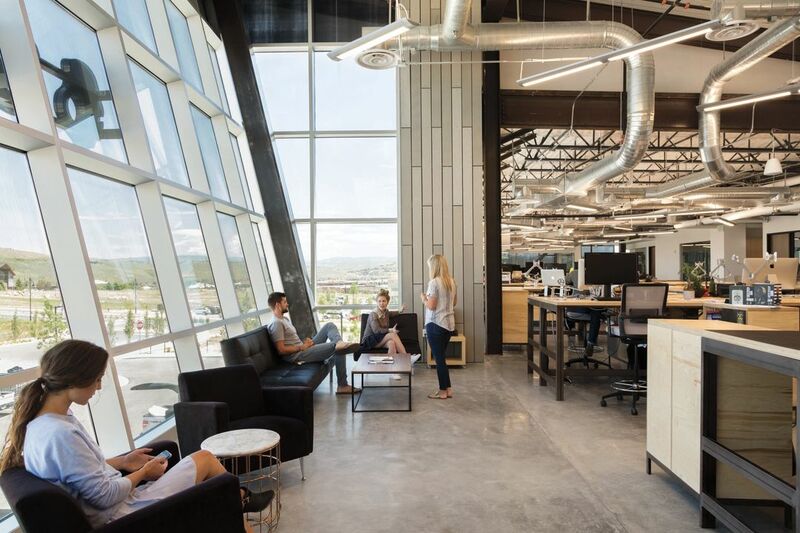 The worldwide headquarters for Skullcandy (6301 N Landmark Dr, 435.940.1545), maker of headphones and audio products, anchors the Park City Tech Center with 49,000 square feet of open-plan work space that screams collaboration. “We were busting out at the seams,” says Senior Global Brand Manager Kathryn Smith of the company’s former offices. The current 135 employees belly up to standing desks in one massive, airy, industrial space on the second floor. Despite the company’s “Stay Loud” motto, adept use of acoustical spray keeps everything humming at a respectable volume. And thanks to poured concrete floors, finance can skateboard or scooter smoothly across to marketing, avoiding well-behaved dogs (yes, there’s a pet-friendly policy) or a group filing out of a music-themed conference room. Everybody has windows—even the corner offices are transparent. The result: “insane morning light,” according to Smith, plus killer views of the ski resorts and adjacent Utah Olympic Park. 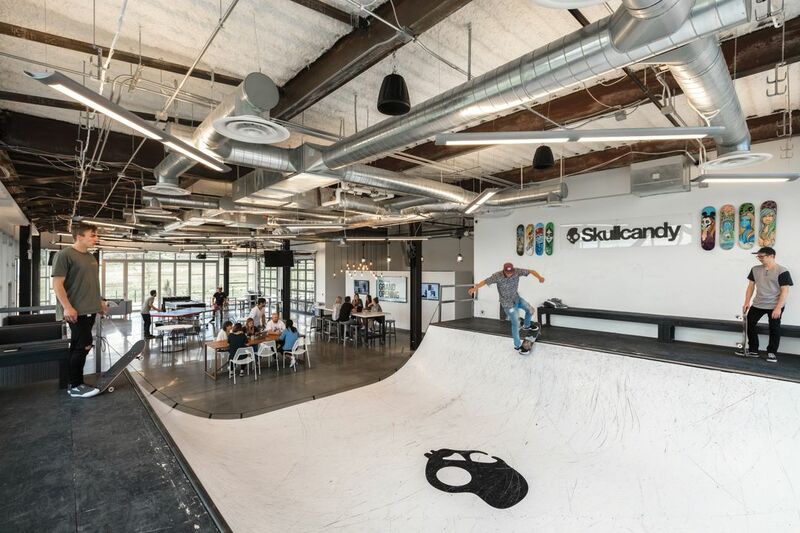 Skullcandy’s “caf” or common area features amenities like ping pong tables and a skate ramp. Oh, yeah. The on-site retail shop—also located on the ground floor—is pretty cool, too. Not as much for its design, but because 100 percent of its profits are donated to Utah charities. Both beer and wine are served at the in-store Silver Mine Taproom. Like Skullcandy, Whole Foods Market (6598 N Landmark Dr, 435.575.0200) recently moved into bigger digs—a brand-new space twice the size of its original Park City location on the other side of Highway 224. But alongside all the organic, natural, non-GMO goodness, the new store offers a feature that’s a Utah grocery store first: 24 beers on tap. 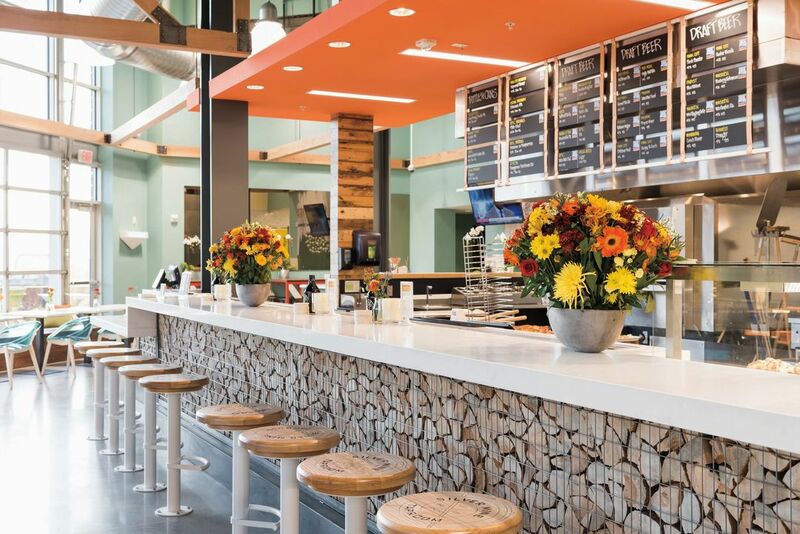 At Whole Foods’ in-store Silver Mine Taproom, you’ll find a rotating selection of two dozen local and hard-to-find on-tap brews plus bottled beers and an ample list of by-the-glass reds, whites, and bubbles. The taproom also serves apps and entrées for the lunch, après-ski, and dinner crowds. Planned theme nights in this space include Trivia Tuesday and Beer-and-Cheese Pairing Friday. The Ritual drinking chocolate and coffee bar. Decompression opportunities aside, the ambience throughout the new Whole Foods’s 43,000 total square feet is very unsupermarket-like. Heavy timber, brick, glass, steel, and concrete were used as finish materials to create a funky, vintage ski-lodge vibe. Lift chairs serve as booth seats and, located 20 feet below the street-grade sidewalk and bus stop, the entryway evokes the essence of a mine shaft—albeit with a great deal more natural light. “It’s very important to us that our stores reflect our local community,” says Whole Foods spokeswoman Allison Phelps. 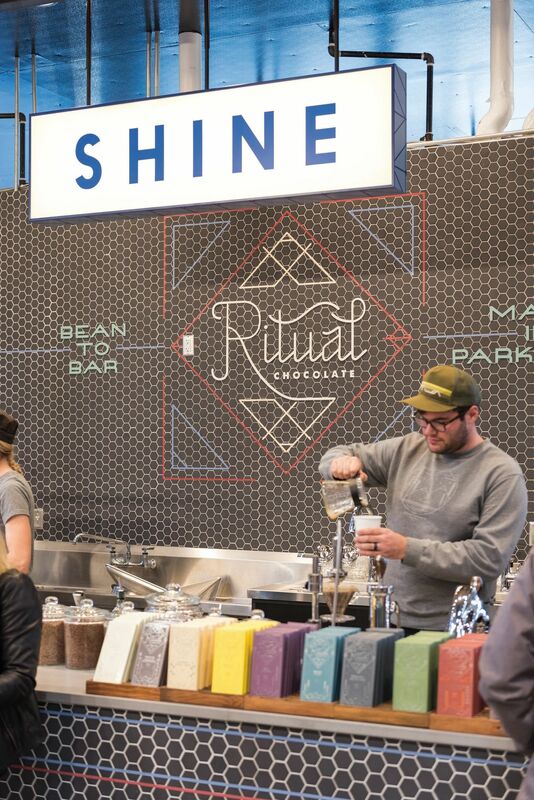 This quest for regional authenticity is also reflected in the local artisans and products you’ll find there, including another Utah grocer first: a coffee and hot chocolate bar manned by the Park City–based Ritual Chocolate.